Twitter warning, Do not click DM saying "My profile was viewed..times..today"
A very quick and urgent warning for Twitter users, If you receive a direct message (DM) on Twitter saying "My profile was viewed..times..today" with a link then please don't click it. If you do, you will run the risk of having your Twitter account hijacked, your account turned into a spam-spewing tweet factory and all of your Twitter followers will be sent a personal copy of the same DM saying "My profile was viewed..times..today". 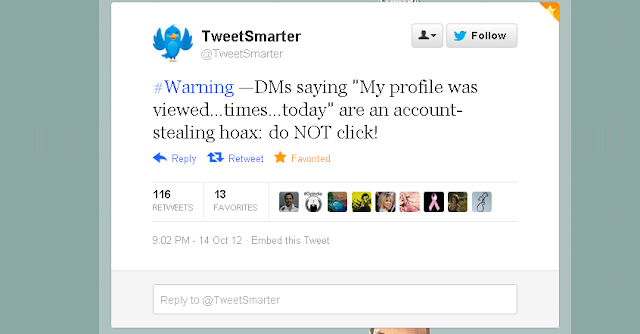 The direct message is a Scam aimed at stealing your twitter account. Or If any of this phishing scheme sounds familiar, it’s because this scam and others like it have been going around for quite some time now. Reason being, they’re all highly effective. Sure, the verbiage in the Twitter DMs may change periodically, but the goal of stealing your Twitter username and password stays the same. ONCE REVIEW all the application you have allowed in your twitter profile, Here. REVOKE access of the suspicious applications immediate.